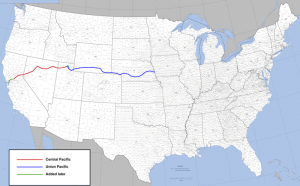 First transcontinental railroad is completed in the U.S. when 1,776 miles of track connects Omaha, Nebraska – the western most point of the eastern rail system – to San Francisco, California. It became the first method of transport to effectively connect the two coasts. Large-scale westward migration followed; towns sprung up along the railroad corridor; and trains carried agricultural equipment, crops, and livestock from East to West.